The new RoofCERT Courses to be trialled at LCB, the National Federation of Roofing Contractors (NFRC) has designated the Leeds College of Building, Roofing division, as a NFRC Centre of Excellence. This news comes as a national first and champions roofing standards. The NFRC and CITB have formulated the new RoofCERT scheme to raise standards in the roofing industry, as well as to protect consumers and professionally qualify the industry. The hope is that this new accreditation scheme will prove to be a huge development in UK roofing, for more information from the best roofing company in North London, call us today. A house in an affluent area of West Hampstead collapsed ‘from roof to basement’ earlier this year. Firefighters were called to the north-west London home and requested the help of police to cordon off the area. 10 of the surrounding neighbours were evacuated after the incident, the London Fire Brigade said. An ambulance crew and first responder were sent to the scene but no patients were there to be treated at the scene. Firefighters and Camden Council’s structural engineers worked to make the scene safe following the collapse. The two-storey house had permission to renovate the basement, however an application to convert the home into two flats was declined. For roof repairs in Hampstead, contact Thomas Roofing. The importance of maintaining your roof was brought home this week when a row of four shops in Hendon, North London collapsed when their roof caved in. Luckily no-one was hurt in the incident but it highlights the importance of keeping your roof in good repair. The roof protects the whole building from the elements but in itself is vulnerable to all that the British weather has to throw at it. Signs of water ingress, damp patches on the ceiling or walls, leaking or missing guttering can appear insignificant but can lead to major and expensive problems if not repaired quickly and effectively. 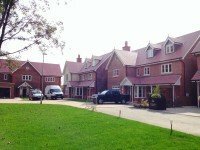 Thomas Roofing are an experienced and long-established family firm working in North London. They are members of the Guild of Master Craftsmen, Confederation of Roofing Contractors, a Which Trusted Trader and member of Fairtrades. The Guild of Master Craftsmen is the UKs most established trade association, representing skilled and rated tradespeople from over 400 trades. The majority of members are modern days craftsmen such as carpenters, builders, plasterers, plumbers and electricians. But the list now also includes craftspeople in landscape design, paving, flooring, interior design and bricklaying. As roofers, Thomas Roofing is also approved by the Guild of Master Craftsmen after having a thorough assessment from the Guild. The Guild also recommends trusted tradesmen who are masters of their crafts through the website www.findacraftsman.com. To find out why we are Guild approved, contact the roofers of North London at Thomas Roofing. Faulty guttering can lead to damp and damage to the brickwork and foundations of your property. If you have a period property it’s even more important to consider the look and style of the guttering used. Many older properties have cast iron guttering which is extremely durable, but also very heavy. Yeoman Rainguard have brought out a new line of aluminium guttering that will enhance traditional and modern properties it’s lightweight, durable and easy to install. Contact us for all your roofing repairs in Islington, London. Police are warning householders to beware of opportunist thieves taking advantage of people and tricking them out of paying for work that is not necessary or botched. Some of these people do try to enter homes and steal from the owners. Unfortunately many of these people pose as roofers and will try to convince the householder that there is an issue with their roof which they can fix. The advice from the police is never to give a job to someone who has just turned up on your doorstep, and never let them in your house, whatever they say. Can they give you references? Make sure they guarantee their work. Have they got a business card or sign written van? How do they want you to pay? A genuine firm will invoice you. A quality roofing company will never just turn up on your doorstep, they will happily give you a quote for the work and references for you to check. Asbestos has been used to insulate and protect our homes from fire for hundreds of years. It is a completely natural mineral which was mined for thousands of years and used extensively in the UK until 1999, although many other countries had already banned its use due to concerns on its effect on people’s health. So long as asbestos is contained it is not hazardous to health, the dangers occur once the asbestos is cut or torn or damaged while being removed. This allows the tiny fibres to be released into the air, these can then be inhaled and can cause serious lung disease and chronic illness. It is a fact that the biggest risk construction workers face is exposure to asbestos. Due to its strength and insulation properties asbestos was used to make roofing tiles and insulation and many UK properties before 1999 have been built with asbestos products. It is essential that any maintenance or alterations carried out on your home is undertaken by trusted, skilled workmen who are aware of the dangers and suitable trained in its safe disposal. For more information on Flat roofing in Hampstead , call us today. Slate roofs have been popular in Britain for centuries. While our European counterparts chose clay tiles for their roofs. Slate’s natural availability in many of the countries regions meant it became the preferred choice for keeping out the elements. Where there was no slate in the local area, thatch was popular as it was easy to transport and could be grown nearby. After the Great Fire of London in 1666 thatched roofs were banned from the city and clay tiles became popular. Clay tiles were introduced by the Romans who used them extensively but once they left we lost the skills needed to make them. In the 12 th century the industry was revived and they continued to be a popular choice. A standard size evolved of 10 1 / 2 ” x 6 1 / 2 ” which was easy to make and handle. Dishonest manufacturers tried to save money by making smaller tiles for the same cost which led Edward IV in 1477 to pass a law to determine an industry standard. The Dutch invented an ‘s’ shaped tile in the 16 th century which could be overlapped vertically and horizontally creating a better seal naturally. These pantiles were much more cost effective as they would cover the same area with 75% less tiles. This type of tile continued to be used and by the 18th century there were being manufactured in London and elsewhere but the technology to produce consistently uniform tiles of regular shape was still not available and this meant the tiles were not always of good enough quality to be used on prestigious buildings and were mainly used on farm buildings where a cheaper alternative to slate was acceptable. Natural slate was still used extensively and with the invention of the railways it was now possible to transport heavy goods around the country and for the first time slate began to be used outside the area from which is was quarried. Now it was possible to use slate on cheaper housing for the ordinary classes. For roof repairs in North London call 0208 801 3984. Concrete tiles which had been developed around 1920 were available but not popular until after the Second World War when it became necessary to undertake a huge rebuilding programme. This continued right up until the 1960s when larger sizes of tile were being sought by builders as they were easier to fix and much of the skilled labour force had disappeared. British clay tile manufacturers found it difficult to compete and many went out of business. Clay tiles and natural slate tiles are in demand once more even though there is stiff competition from foreign imports. If you are looking for a roofing company in Islington to carry out repairs call Thomas Roofing. Redland has introduced a new colour to its Rosemary Clay Craftsman Tile range. The new tile, Craftsman Victorian tiles have been made to resemble original Victorian tiles, with pitted surfaces, black patterning, irregular front edges and a carried hanging length. The aim is to imitate a weather tile which is still very durable. For all Flat roofing repairs in Islington, please call us today. The Flat Roofing Market continues to grow, showing itself to be a cost effective solution for new builds and for Public Sector authorities with an eye on their budget. A recent report by AMA Research has indicated that the UK Flat Roofing Market has grown by 3.5% and this is expected to grow further as public spending cuts continue and local authorities, schools and the NHS have less money to invest in infrastructure. Flat roofing is a more affordable solution for some areas and with more products coming into the market place the flexibility, choice and speed in which a flat roof can be installed make it a very attractive option. Although Bitumen still has the largest share of the market newer PVC single ply membranes are becoming more popular and there is a greater selection of colours available at an affordable price. If you are looking for a Roofing company in Enfield, please call us. If the roof on your North London home has seen better days, don't leave it too late before seeking expert attention. Damaged roofs can not only lead to leaks, but can allow all kinds of peststo take up residence in your property. However, finding a reliable and professional roofing company to carry out your roofing repairs can be a daunting prospect. Sohere's a few pointers to help you to choose the right company for you. Professional roofing companies should be able to show you evidence of their roofing qualifications. However, for extra peace of mind, you may also want to check that they are members of trade associations such as the Confederation of Roofing Contractors, the Guild of Master and the Fair Trade Association. Do they cover all aspects of roofing? As you can appreciate, there are many different types of roof. Whether your property has a flat roof or a pitched roof, is constructed from slate or tiles, your chosen roofing contractors should be able to complete your roofing to the highest possible standard. After all, if you're looking for the best roof repairs Enfield has available, you'll need to be sure that the company has the relevant knowledge to fix all kinds of roof repairs. Do they sub contract jobs or do all the work themselves? Some roofing companies choose to sub contract their work to other roofers. While there's nothing wrong with this, if you prefer to know exactly who is going to carry out the repairs to the flat roof of your Hampstead property, you'll want to be sure that you're using the best repairers of flat roofing Hampstead has available.With over 25 years' experience in all kinds of roofing services and roofing repairs, we'd like to think that we're a roofing company North London property owners would happily recommend, so if you'd like to know more about our services, why not give us a call today? Welsh Slate has introduced a range of roof bat vents which are suitable for all of the 17 species protected by law. The slates are available in a range of sizes and provide a discreet and uninterrupted weatherproof path from the outside of the roof to the inside. If contractors discover bats or their roosts on the site where they are working they must stop work and contact the relevant Statutory Nature Conservation Organisation. There has been a growing concern within the roofing industry over the number of roof fires caused by gas torches being used on flat roofing. The National Federation of Roofing Contractors has come up with a simple checklist to determine if the use of a gas torch is necessary on each and every roof. The checklist can be used by all contractors on site where if you tick a box against certain details, then it is advised not to use a torch-on system. With the checklist now in circulation it is has been very well received in the market generally and contractors are finding the guidelines really helpful in their decision making process. The Health and Safety Executive have also agreed to circulate copies to their inspectors to make sure that contractors are doing the right thing on site with the use of gas torches.